If summer was a dessert, it would be Berrymisu. A fun play on classic tiramisu, strong coffee is replaced with colorful berried busrting with flavor. The combination of soft vanilla cake, Chantilly cream and berries screams summer, even on a cold winter night. Bake the cake according to the intructions on the box. If you want a lighter cake use two eggs instead of three. While the cake is cooling slice the larger berries, like strawberries and black berries. Whip the cream with the icing sugar and vanilla to soft peaks. Cut the cake into 1 inch thick slices and layer half on the bottom of a trifle dish. 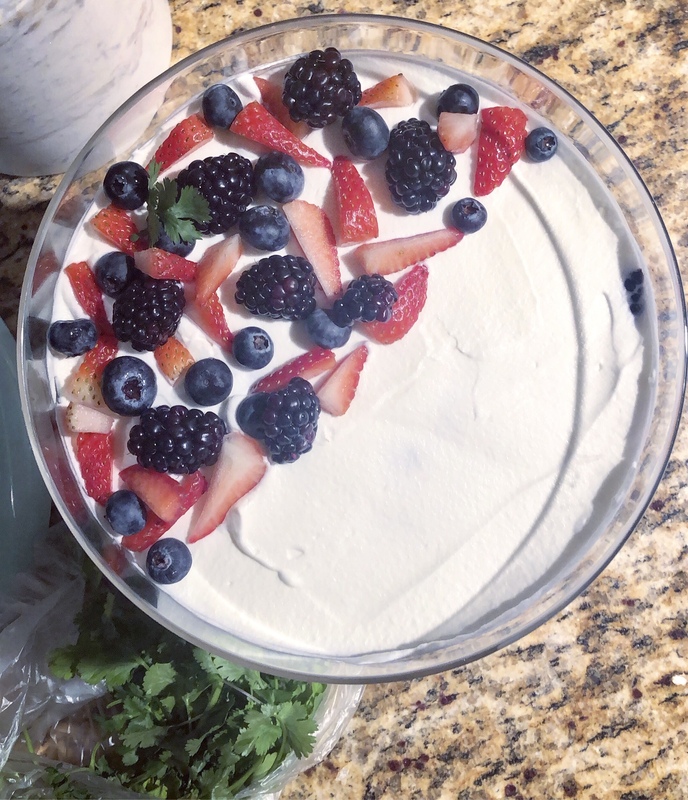 Then do the same with half the berries, then half the cream, and repeat with the remaining ingredients. Save some berries to spread over the top. Refridgerate for at least 4 hours before serving. A variation that I sometimes make is I cook the berries in a saucepan over a low flame until they burst and release their juices. Then I cool them before layering with the cake and cream. It’s a different texture, and the juices soak into the layer of cake and you get more flavor out of the berries.